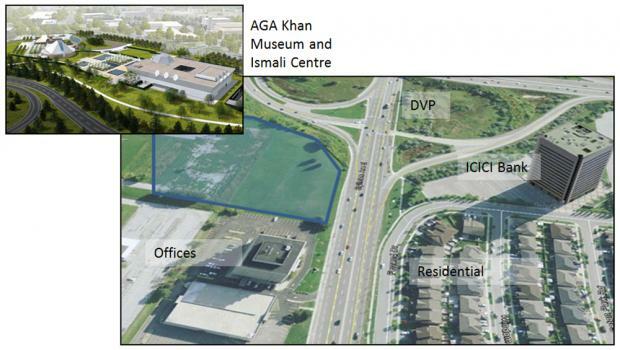 The Aga Khan Park & Museum Crosstown stop will be at surface stop. The accessible stop will be a centre platform or parallel side platform, with the stop located on the west side of the intersection of the DVP southbound exit ramp and Eglinton Avenue East. Between Brentcliffe Road and Victoria Park Avenue, there will be a 0.5 meter wide buffer on both sides of Eglinton to provide additional space between the bike lanes and vehicular lanes. Disclaimer: These renderings represent station design at a level of 60 per cent. Given the aggressive timelines and significant scope of the project, construction will begin as design continues to be refined. As such, renderings are for illustrative purposes only and are subject to change.